The sixth edition of the Austrian Darts Open was held in the Steiermarkhalle in Graz/Premstätten from 20 to 22 April. 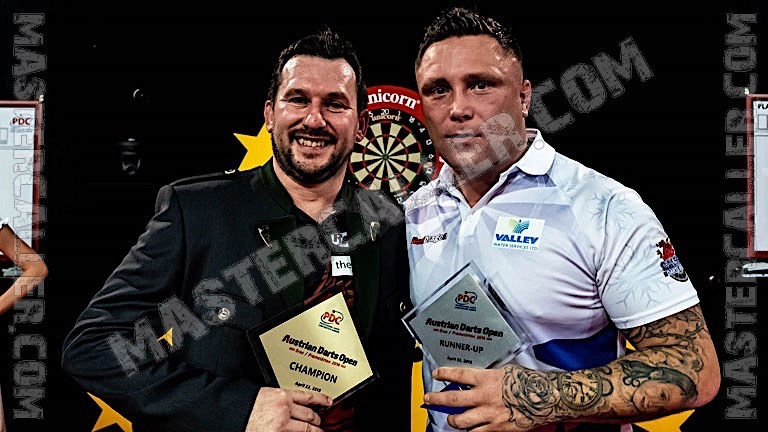 Jonny Clayton wins his first EuroTour title by defeating compatriot Gerwyn Price in the final 8-5. Defending champion Michael van Gerwen is not in Austria to defend his title. On his way to the final, Clayton beats German ace Max Hopp, number one seed Peter Wright, James Wade, Ian White and Mensur Suljovic. Gerwyn Price reaches the final after winst against Scott Taylor, Wayne Jones, Rob Cross and Joe Cullen. IThe tournament is played in almost tropical conditions in Graz, but the atmosphere is excellent due to the good performance of The Gentle Mensur Suljovic. In the final it stays close a long time with breaks of throw from both players. Trailing 4-5, Clayton hits a crucial 120 finish, followed by a leg where he holds throw and an 11-darter in the leg after. The 7-5 gap he has at this point is enough to secure victory for Clayton. Fourteen darts later ‘The Ferret’ can call himself Austrian Darts Open champion 2018. Clayton is the first Welshman to win a EuroTour title, after what was, of course, the first all-Wales final. The only other EuroTour finalist from Wales is Jamie Lewis. He was in the final in Gibraltar in 2013, but lost it.